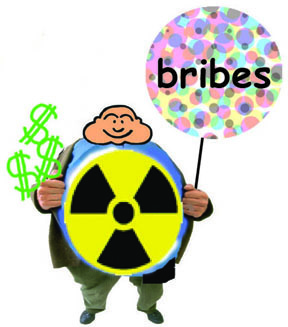 Australian government successfully bribing Kimba community to host radioactive trash? More than 30 projects in the Kimba district will share in $4 million from the National Radioactive Waste Management Facility Community Benefit Program. Resources Minister Matt Canavan announced the successful projects near Kimba and Wallerberdina Station near Hawker on Wednesday, with 33 out of the successful 45 projects located in Kimba. The successful projects include big projects such as a new palliative care wing at the Kimba Hospital, and smaller projects like air-conditioning in the Kelly Pioneer Memorial Hall. The projects vary from new infrastructure and upgrades to existing infrastructure, community projects, feasibility studies and trials. Mr Canavan said the two communities, which were being consulted about hosting the facility, were invited to submit projects that “deliver social and economic benefits to their area”. “Two million dollars for each community is a significant investment, designed to help offset the time and resources they are devoting to the detailed consultation program underway,” Mr Canavan said……..
“Two sites in Kimba and one at Wallerberdina Station volunteered to host the facility, and are currently in a detailed community and technical assessment process. “The Community Benefit Program is a key part of the process.”…….